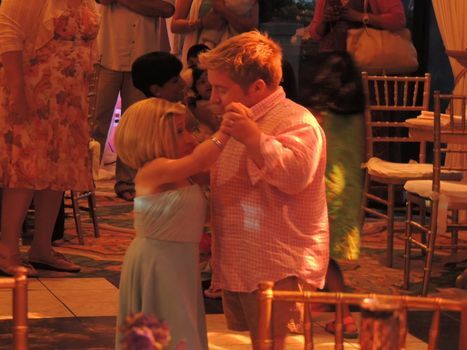 The Little Couple’s Dr. Jennifer Arnold and Bill Klein renewed their wedding vows in a April 27 beach ceremony in Galveston, followed by a reception held at Hotel Galvez & Spa®, A Wyndham Grand® Hotel. This milestone is featured in two upcoming episodes airing in June. The first of this two-part episode will air on Tuesday, June 10 on TLC; coincidentally, this is the hotel’s 103rd anniversary. The concluding episode will be featured in the season finale on Tuesday, June 17. Check local listings for times. Klein asked his wife to marry him for a second time in the hotel spa’s Meditation Garden. A surprise ceremony on Sunday, was attended by friends and family, and followed by a beach themed reception in the hotel’s veranda. The menu ranged from a huge seafood display filled with lobster, crab and shrimp to popcorn and French fries, favorites of Jennifer’s, to mini corn dogs, chicken nuggets and a cupcake decorating area for children. The evening was complimented by a signature drink, designed for the couple by the hotel, and served during the celebration. The season opener also features other locations in Galveston including Nonno Tony’s World Kitchen at Pier 21. The Little Couple’s Dr. Jennifer Arnold and Bill Klein renewed their wedding vows in a April 27 beach ceremony in Galveston, followed by a reception held at Hotel Galvez & Spa®, A Wyndham Grand® Hotel. This milestone is featured in two upcoming episodes airing in June.